Updated at 7:15 p.m. with comments from Marathon. U.S. Rep. Rashida Tlaib (D-Detroit) is questioning assurances from state environmental regulators that a “rotten-egg” smell in southwest Detroit is not harmful. In an email to the Michigan Advance, Tlaib spokesman Denzel McCampbell explained a recent statement the congresswoman made in Detroit over an issue at the Marathon Petroleum refinery that led to a pungent smell. 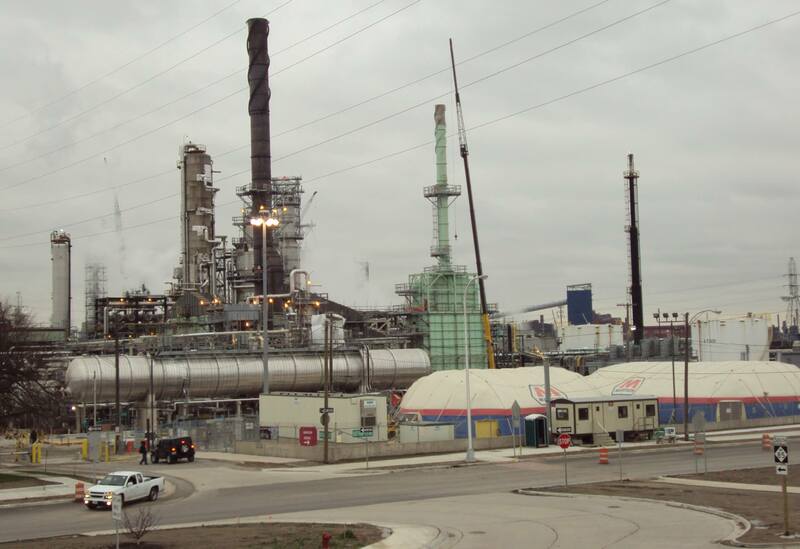 Marathon has said the stench was caused by a malfunction with the refinery’s coke-flare system. Officials at the then-Department of Environmental Quality (DEQ)* have assured the public that the smell is not a health concern. Marathon shut down its coke-flare system this week to conduct repairs and said the smell was caused by hydrogen sulfide and mercaptan compounds. “It’s well-documented how the Snyder Administration failed folks in Flint,” he continued. The DEQ has for years given preference to corporate polluters “over the voices of residents,” McCampbell said. Tlaib is encouraging residents “to take action if they feel something is wrong,” he added. Marathon will begin repairing the flare system Friday afternoon and is continually sharing air quality data from ongoing sampling with the DEQ, Detroit and the EPA, according to company spokesman Jamal Kheiry. Kheiry previously apologized for the smell on behalf of Marathon. DEQ spokesman Scott Dean declined to comment on Tlaib’s statement. But data from Marathon and the federal government have not shown cause for air quality concern, according to Dean. “Apart from the odor, neither EPA’s or Marathon’s air quality sampling detected any exceedances of health thresholds during the event,” the DEQ reiterated in a Thursday statement. The DEQ is working with the U.S. Environmental Protection Agency (EPA) and Detroit officials to monitor the situation. Marathon attributes the malfunction to extremely cold weather and is inspecting the refinery plant for other damage the cold may have caused, according to the DEQ. * This story has been corrected to include the correct department name.